Ryan Zinke has been Interior secretary for just two months, but leaders of some tribal nations in the West say he’s already been a disappointment. Amid a looming deadline for a review of a controversial monument within sacred tribal lands, Zinke hasn’t picked up the phone for the very Indigenous leaders that could be most impacted by his decision. On Wednesday morning, the Bears Ears Inter-Tribal Coalition held a conference call responding to President Donald Trump’s executive order on monuments. Leaders of the coalition, which represents the Hopi Tribe, Navajo Nation, Ute Indian Tribe, Ute Mountain Ute Tribe and Pueblo of Zuni, requested an audience with the Interior secretary. They say Zinke, since he took the helm of the Department of the Interior, has been conspicuously reclusive with the tribal nations he promised to represent. Last week Trump ordered a review of all national monuments of more than 100,000 acres created since 1996, plus sites that may have received insufficient public input prior to designation. Zinke has until June 10 to issue a recommendation of potential changes to Bears Ears National Monument and 120 days to issue a final report on two dozen other monuments. Members of the Bears Ears Tribal Commission, which will participate in the development of the monument's management plan. 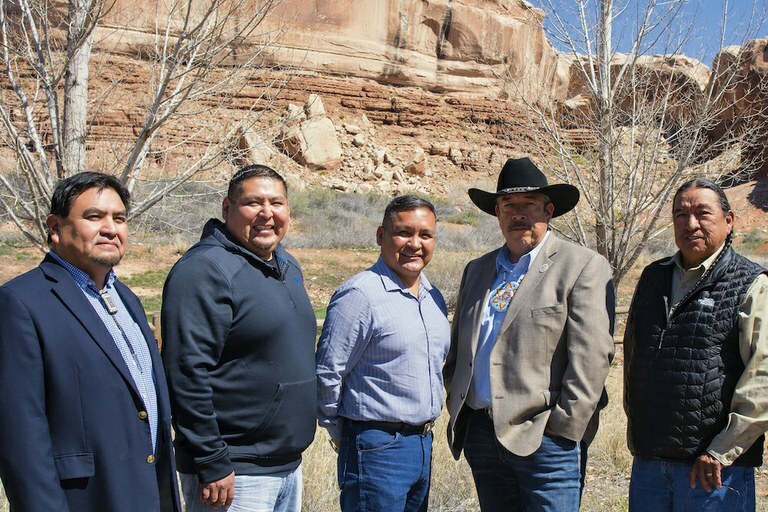 Pictured, left to right: James Adakai, Navajo Nation; Carleton Bowekaty, Pueblo of Zuni, Alfred Lomahquahu, Hopi Tribe; Shaun Chapoose, Ute Indian Tribe; and Terry Knight, Ute Mountain Ute Tribe. Commissioner not pictured: Davis Filfred, Navajo Nation. During the call, made from the National Press Club, in Washington, D.C., leaders from the Navajo Nation, Ute Indian Tribe and other Southwest tribes criticized Zinke for ignoring multiple requests to meet with them and discuss Bears Ears. The monument, enacted in the final days of the Obama administration, created a collision of Western issues that include tribal sovereignty, federal overreach and public land management. But in the early days of the Trump administration, members of a number of Southwestern tribes say that the new secretary’s early actions don’t align with his claims. Shaun Chapoose, chairman of the Ute Indian Tribe’s business committee, said Zinke “has an important role to play” in establishing the relationship between tribes and the nascent administration. 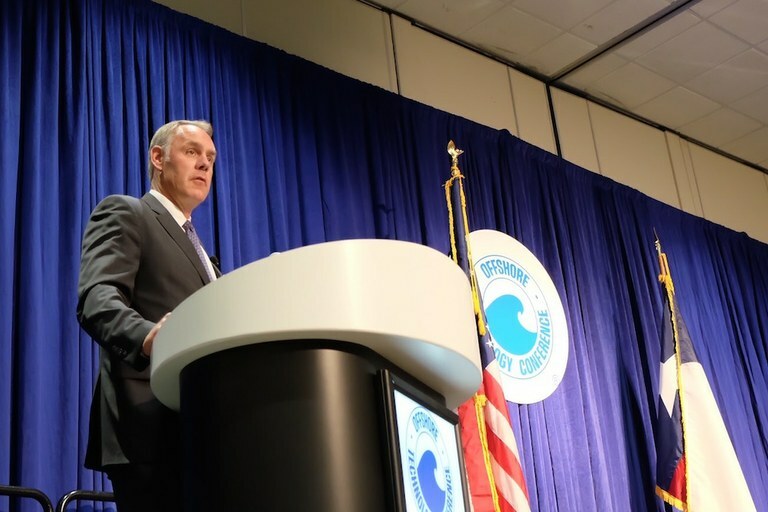 Interior Secretary Ryan Zinke at the Offshore Technology Conference in Houston, Texas, on Wednesday. That morning, tribal leaders gathered in Washington to criticize Zinke for not responding to requests to meet with them over Bears Ears National Monument. Further angering some tribal leaders, Zinke has found time to meet with Utah state lawmakers, who want reduced or rescinded boundaries for the Bears Ears and Grand Staircase-Escalante monuments. According to the Interior Department, Zinke will visit Utah next week as part of his review, and the secretary said Tuesday that his trip will include a horseback tour of monument sites. “I’m going to ride a horse, like Teddy Roosevelt, and see the land and talk to the Navajo and the nations of tribes,” Zinke said at a conference in Houston, Texas, where he signed an order to review offshore drilling bans, according to Reuters. Following Wednesday’s conference call from D.C., a staffer from the Bureau of Land Management’s Utah office called the Bears Ears Inter-Tribal Coalition on behalf of Interior to set up a meeting with Zinke. According to the coalition, tribal leaders will meet with the Interior secretary on Sunday in Salt Lake City. Note: This story has been updated to correct the Grand Canyon Trust’s role in the tribal coalition’s meeting with Ryan Zinke. They are not coordinating the meeting.